On August 6, 2014, Russia issued an order banning certain agricultural imports from the United States, the EU-28, Canada, Australia, and Norway for one year. The products banned include beef, pork, poultry, fish and seafood products, fruits and nuts, vegetables, and some sausages and most prepared foods. In calendar year 2013, the United States shipped $1.3 billion of agricultural and related food products (including fish and forestry products), and of this amount approximately 55 percent are products now restricted. Russia is the 5th-largest agricultural import market in the world after the EU, China, the United States and Japan, with total imports of agricultural and related products in 2013 of $40.4 billion. 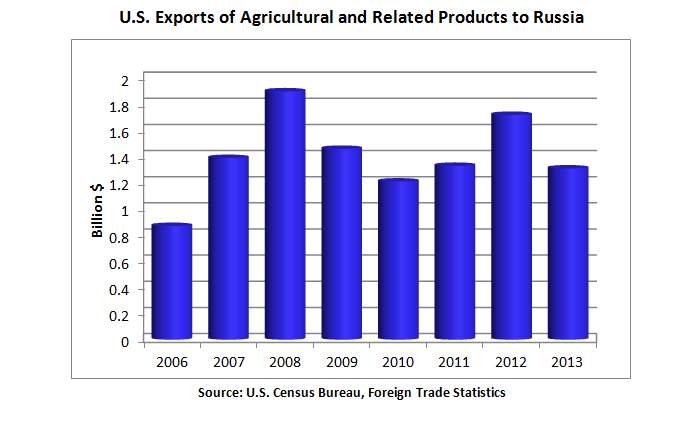 Russia was the 20th-largest market for U.S. agricultural and related product exports in 2013, with exports worth $1.3 billion, accounting for less than 1 percent of total U.S. agricultural exports. Exports in the first half of 2014 were $606 million, up 4 percent from the same period last year. The United States has relatively small market share in Russia as a result of the geographical distance and other factors, with only about 4-percent share in 2013. The EU-28 is the dominant player, supplying nearly 40 percent of the Russia agricultural market, followed by Brazil with 9 percent. Poultry – U.S. poultry meat and product exports in 2013 were $310 million and Russia was the 4th-largest market for U.S. poultry, accounting for nearly 6 percent of U.S. poultry exports. In 2008 U.S. poultry exports had been over $800 million (18 percent of total U.S. poultry exports), but the combination of trade restrictions and the growth of the domestic Russian poultry industry reduced U.S. exports. The United States had more than half of the market share of Russia’s poultry imports in 2013, followed by Brazil. Pork – U.S. pork and pork product exports in 2013 were just $18 million as, for much of the year, Russia restricted all U.S. pork, beef and turkey. Russia had previously been a much larger importer of U.S. pork and, as recently as 2012, exports had been at $267 million. This market was partially reopened earlier this year, with especially large shipments of U.S. pork in May and June of 2014 (June exports were $34 million). The EU-28 is historically the largest supplier (although EU-28 exports have been restricted for a number of months as a result of African Swine Fever restrictions) followed by Brazil and Canada. The United States provided less than 1 percent of Russia’s pork imports in 2013, although in 2012 it was 12 percent. Beef – U.S. beef and beef product exports to Russia in 2013 were only $1 million because, as with pork, in early 2013 U.S. beef was restricted and this restriction remains in effect. In 2012, U.S. exports of beef to Russia had reached a record $299 million. Brazil was the largest supplier of beef to Russia in 2013, followed by Paraguay. The U.S. provided less than 1 percent of Russia’s beef imports in 2013, although in 2012 it was 8 percent. Milk and Dairy Products – The United States has not shipped significant quantities of dairy products to Russia since 2010 because of Russian certification and establishment listing requirements. Belarus is typically the largest supplier of milk to Russia, with the EU-28 the largest supplier of cheese. Tree Nuts – Russia has been a rapidly expanding market for U.S. tree nuts. In 2013 U.S. exports in reached $172 million, nearly triple the level of 2010, and accounted for 2 percent of total U.S. tree nut exports. Russia was the 12th-largest importer of U.S. tree nuts. The United States is by far the largest supplier of tree nuts to Russia, followed by Iran. The United States provided more than half of Russia’s total tree nut imports in 2013 and more than 95 percent of Russia’s total almond imports. In 2013, U.S. almond exports to Russia totaled $139 million and U.S. pistachio exports totaled $31 million. Fresh and Processed Fruit – Although Russia is one of the largest fruit importers in the world, only a very small share comes from the United States. In 2013, Russia was the 19th-largest market for U.S. fresh fruit, worth $34 million (less than 1 percent of U.S. fruit exports). The EU-28 was the largest supplier of fresh fruit to Russia in 2013. Key fresh fruit exports from the United States to Russia in 2013 included apples, totaling $13 million, and pears, totaling $12 million. For processed fruit products, U.S. exports in 2013 were $16.2 million with the largest product being prunes, with exports totaling $10 million. Prepared Food – Russia has been a growing market for U.S. prepared foods, with exports in 2013 of $84 million. The Russian Custom codes on the banned list cover most U.S. prepared food. Fresh Vegetables – The United States only sends limited amounts of vegetables to Russia, with total exports in 2013 of $1.1 million. Fish and Seafood – Russia has been a growing market for U.S. fish and seafood exports, with the largest product being salmon roe for Russian red caviar. Exports in 2013 to Russia reached a record $83 million. Russia was the 8th largest market for U.S. fish and seafood in 2013, accounting for 2 percent of total exports of these products.